Really interesting to see these shots. I have always wanted to see a WSF next to a BCF, but obviously the opportunities for that are fairly rare. 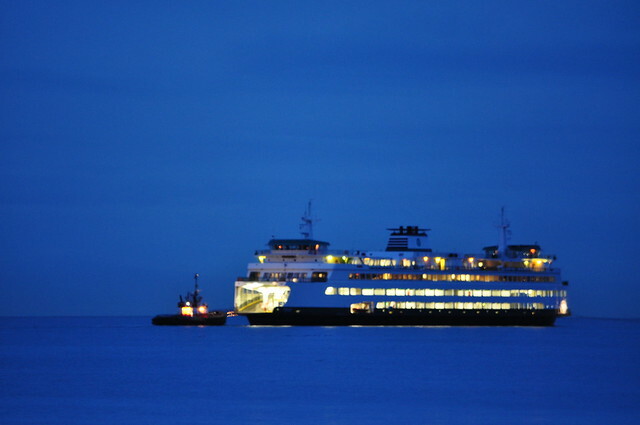 This shows, with a common scale, the size of the Puyallup against a BC Ferry. The height difference (unsurprisingly) is quite large. Well, there's that whole extra car deck thing that adds about 9 feet for starts. 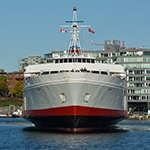 MV Puyallup at Vancouver Dry Dock. This was a really dark photo that I turned up the brightness on, so you'll have to excuse the grainyness. Starting off with a grainy shot taken from Jack Poole Plaza. The Washingtonians outraged when they saw Scott's photo of the slugs on the funnel, so WMG promptly repainted her. Her propellers are fixed pitched. 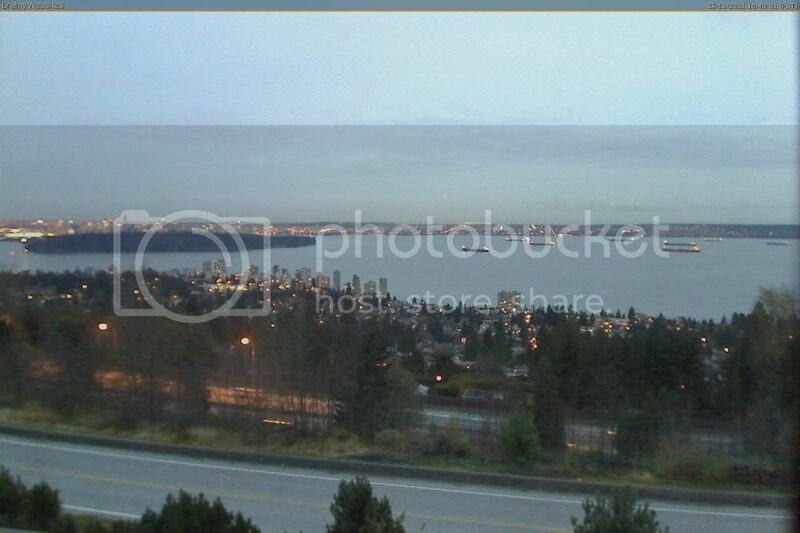 She is scheduled to leave North Vancouver at 1500PST, 11-25-2011, for Anacortes, STCWON. 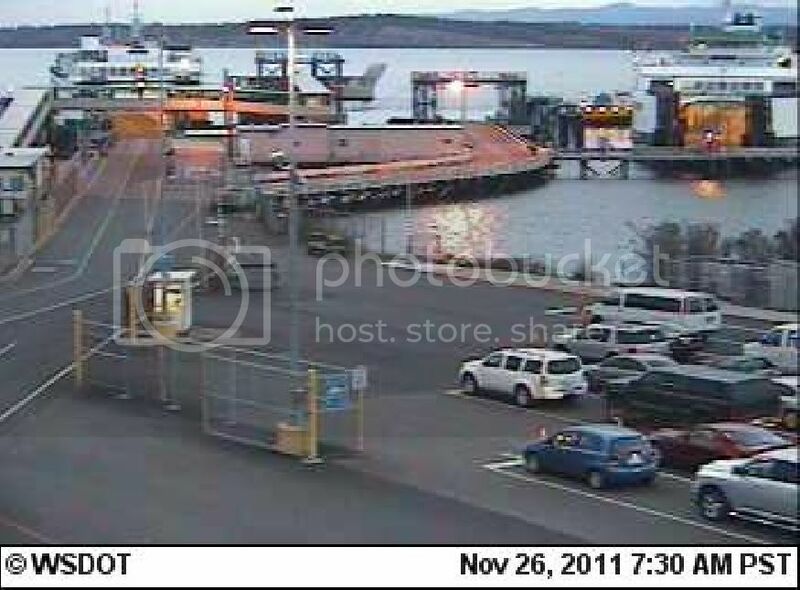 Coming down to the last hour of her visit, the PUYALLUP is joined at the yard by a BC ferry! The BOWEN QUEEN. 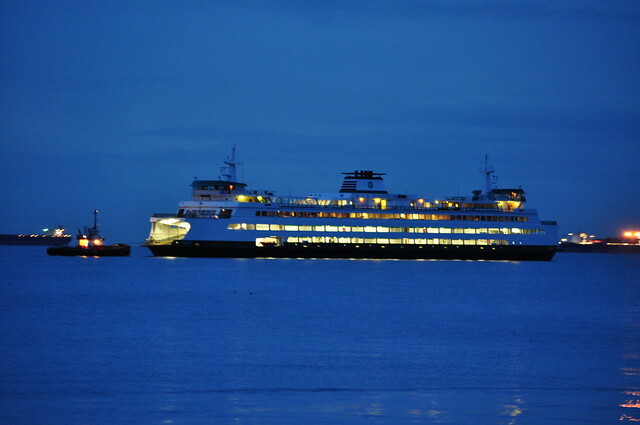 BC Ferries and Washington State Ferries. I'm posting this on my iPhone on the train on my way into downtown Vancouver. Hope to be armed with photos when I get back! 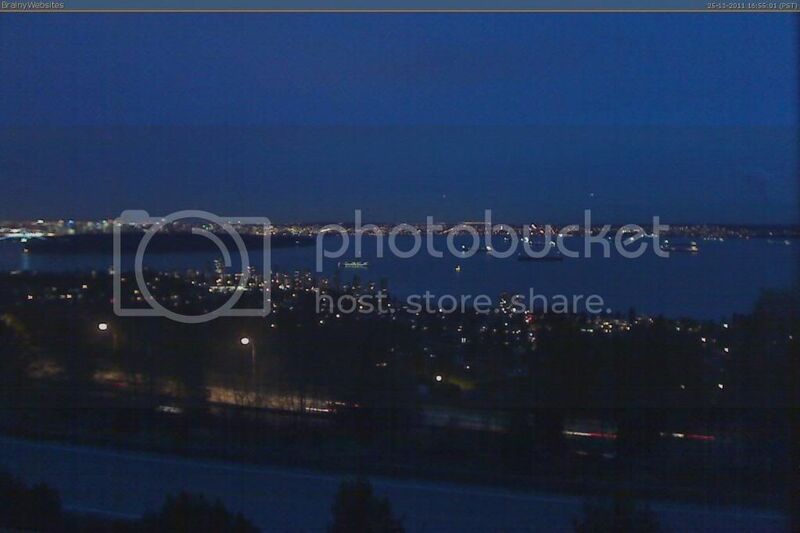 As the PUYALLUP leaves Burrard Inlet, here are some cams to look at. A couple of these may stop refreshing at the end of daylight hours. The PUYALLUP has been pulled out of the drydock. She's surrounded by the tugs CH CATES I, CH CATES II, WESTERN NAVIGATOR, and SEASPAN FALCON. Looks like she's on her way out now with the tug WESTERN NAVIGATOR towing and the Cates tugs on her sides. 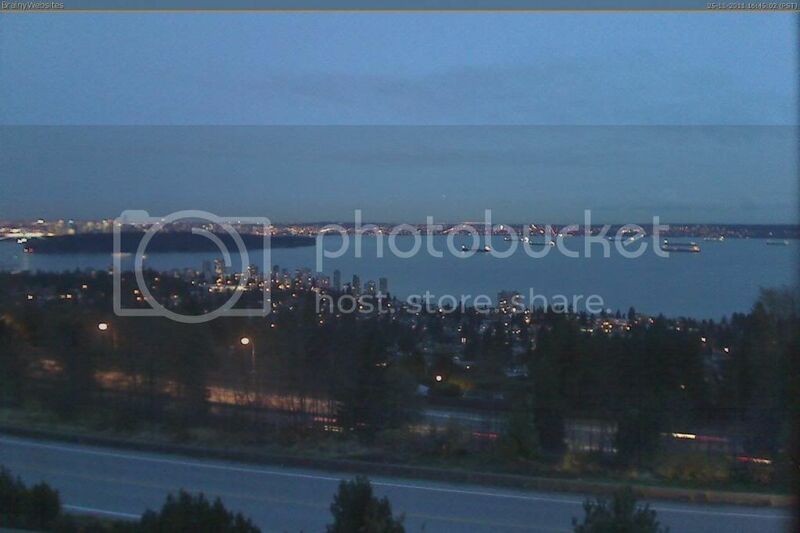 Here are some webcam captures of the PUYALLUP leaving Vancouver. Under the Lions Gate Bridge. 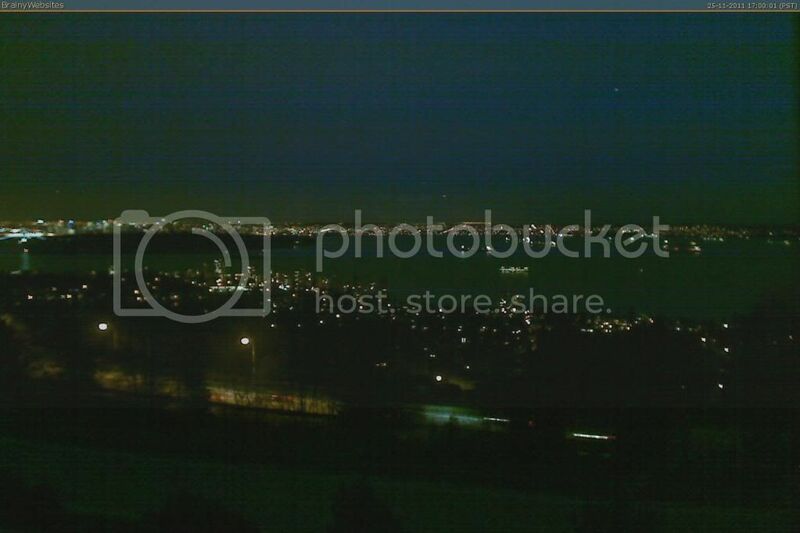 Last photo from this cam. 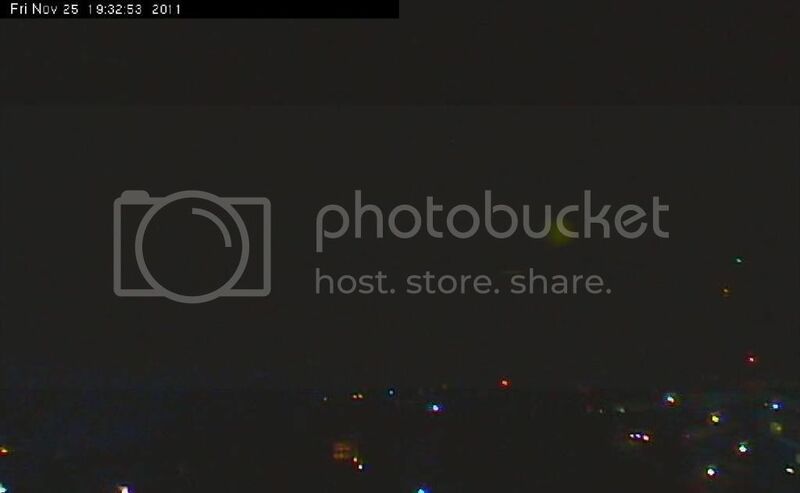 You can barely see her lights from this cam. Next to that bright fuzz. 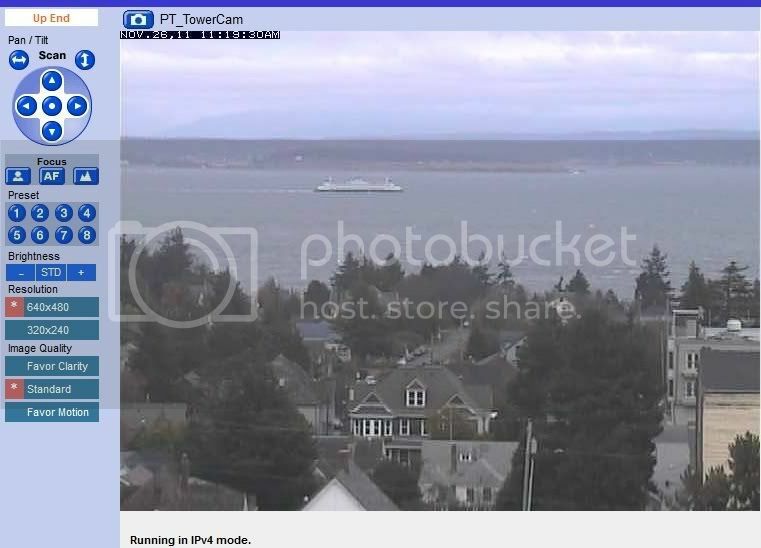 Last webcam photos of the PUYALLUP from Vancouver. Next up, Anacortes. 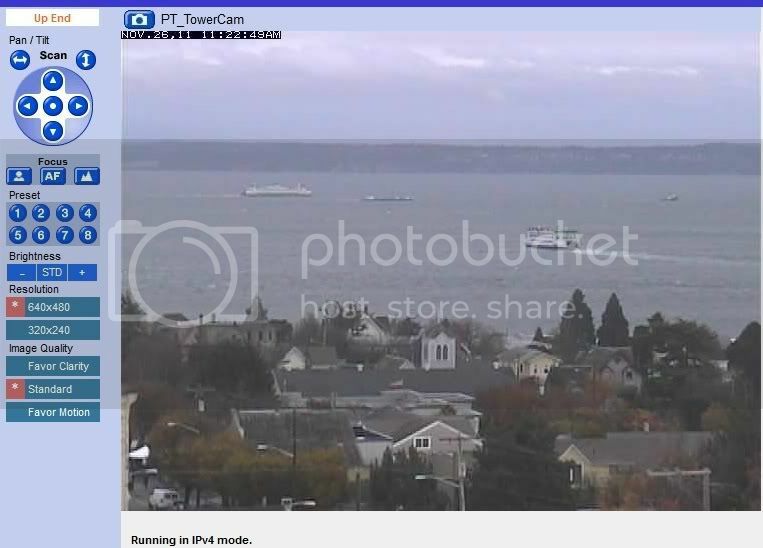 At about 2010PST, the PUYALLUP crossed the horizontal international borderline and is back on her native waters again. She had the COASTAL CELEBRATION crossing her bow at a fair distance, Tswwassen-bound. It will be abeam Point Roberts or later when she'll meet the Alaska-bound MALASPINA. Two Spaulding ships meeting at the oddest place. Puyallup with the Bowen Queen. 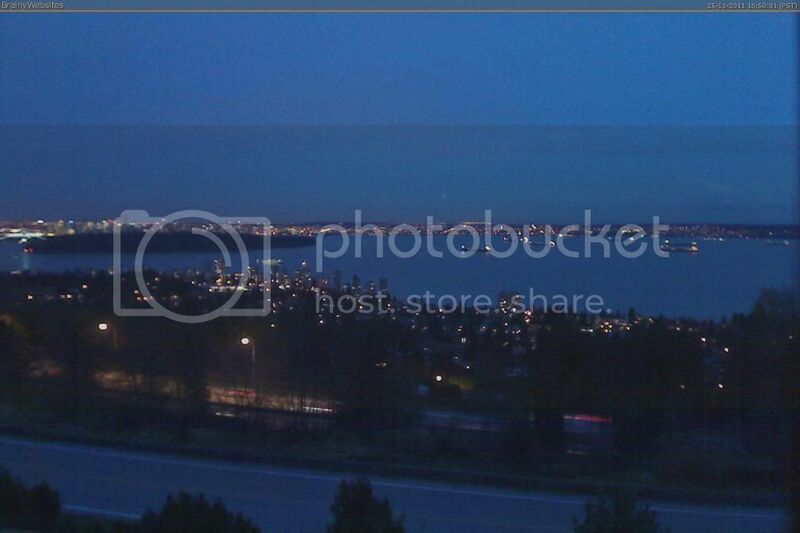 Puyallup approaching the Lions Gate Bridge. Actually, truth be known, I'm no fan of the 'Flying T,' either. The PUYALLUP is back in WSF property. 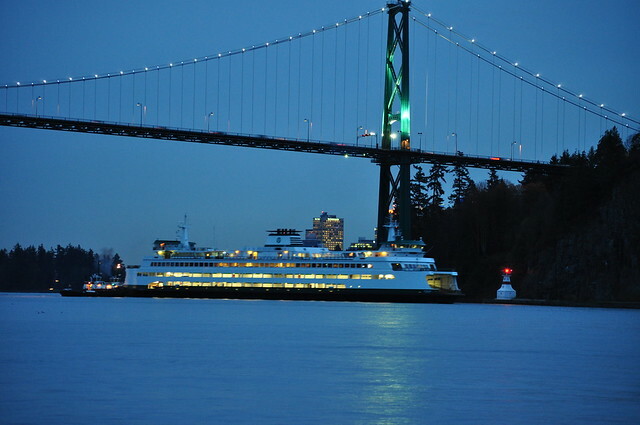 It's been fun to see this ferry up in BC through the photos taken by our Canadian colleagues. And, seeing her with the BOWEN QUEEN is really neat. You don't really get to see a BCF and WSF close together in a photo everyday. 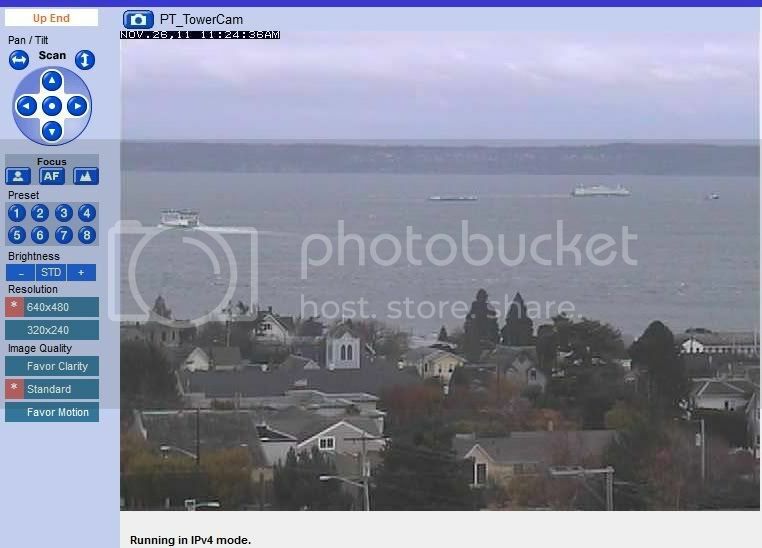 The ship trackers show the PUYALLUP returning south from Anacortes on her own power. The PUYALLUP off Fort Casey. SALISH and PUYALLUP with the tug and tow HUNTER D.
It was a great shipyard and we made many friends. The people there are outstanding professionals and the some of the best in the business. The Puyallup benefitted greatly by the experience and would go back tomorrow given the chance. If any of the readers work at the Vancouver shipyard, thank you so much for your fine work, we have the greatest respect for you guys. Chief and the Puyallup engine room crew. :)thanks for posting those interesting shots of Puyallup, I don't get out like I used to, and I rely on folks like you, that still have their youth! :)mrdot. Chief, I'm curious. What made the trip to Vancouver so good? With the major government contract Vancouver won recently, I'm glad you consider them to do good work... they've got their work cut out for them in the next few years. I was under the impression that the Puyallup wasn't getting a lot of work done, with this being mostly a regulatory drydocking. What kind of work did the shipyard do? Also, how does Seaspan compare to Todd? Two quick thoughts - MileagePhoto, I love the shot going under the Lions Gate Bridge. Chief - good to see you posting on here again. Nick, yes the scope of work was limited to regulatory inspections and some minor repairs to conditions found during underwater and void surveys. The qualities that I see at Vancouver were safety, excellent communications, pride in performance and well maintained infrastructure. The Vancouver shipyard has it's own lock out tag out program that is well sorted out and it places an obvious emphasis on the subject of safety top to bottom. The safety officer has a seat at the daily progress meeting. 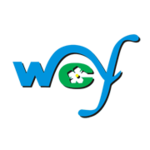 We have never been to another shipyard with it's own LOTO program, they always have utilized the WSF system. I wonder what they do when a customer comes in with a poorly considered or documented system. The shipyard communication with our crew was superior. The yard provided it's own radio to us so we could talk to the shipyard foreman or safety office at any time. There was no going ashore to find anyone and likewise when the yard needed something from us they could get it done quickly. Also, at the shipyard worker level these guys would talk to us individually about the jobs they were working on, made suggestions based on what they had seen on other vessels, recommend products and asked us about the good features they saw on Puyallup. At any other shipyard we have been to in Puget Sound, except our own Eagle Harbor, the workers seem to avoid even making eye contact. Maybe that is what we liked about the Canadians, they are so much like our own guys at EH. Finally I would say the Vancouver guys had pride in their work, they were very respectful of our engine room and wanted to keep it as clean and shinny as when we arrived. I like that in a shipyard because it is respect we can relate to as mariners. They were like a visiting ship's crew. We never worried about pilfrage, lent tools back and forth freely and can say there was never the sense we were being invaded as is the case that sometimes occurrs in a shipyard. It is obvious from the condition of their dry dock, how it was maintained, the condition of the tugs how they were operated that this is a great facility that WSF should consider for a broader range of work in the future. We also liked how the Canadians in the North Vancouver area around the shipyard appreciate their maritime heritage and will look forward to coming back at the completion of the "shipyard park' being constructed near the Pinnacle hotel where we stayed. I don't think you will ever see such a thing coexisting on our side of the water. Thanks for elaborating, Chief. I'm glad to hear it was a positive experience for you.